From the webcast yesterday, the JooJoo (previously named Crunchpad) seemed flimsy and barely working. But now that we spent a good deal of hands on time with it, we can say that Fusion Garage executed an internet tablet quite well. Here are some new facts I gathered from the meeting. First, the device runs a 1.6GHz Atom processor with 1GB RAM. The guys at JooJoo said they weren't ready to reveal specs yet, but I saw the bootup sequence—a standard BIOS setup that displayed what it was booting to—and saw the specs. Chandra, CEO of Fusion Garage, says that the demo hardware was basically the final hardware, so it's easy to put two and two together. As for the graphics card + CPU combination, it's probably an Nvidia Ion chipset. They claim that it handles 1080p YouTube video fine—we only got to see a few seconds of 720p and 1080p HD YouTube video because the internet connection was acting up—so it's probably an Ion. But the HD video we tested looked just fine on its 12-inch, 1366x768 resolution screen. Again, the Ion chipset is just an educated guess, but there are few other hardware options that can handle 1080p video smoothly, and an Atom CPU by itself (which we did see) can't do it on its own. There is a headphone jack, a microphone jack, a built-in webcam at 1.3 megapixels, a charging port and a USB slot. The external card slot present in the prototype isn't going to make it to the final version, but they are thinking of making it available to put a 3G card in there in the future. No TV out/HDMI out yet, but they are thinking about that. There are built-in speakers for playing back audio without headphones, and they're decent enough that you can actually listen to them, but you'll want to plug them in to speakers for any kind of extended video consumption. The tablet actually handled pretty well, with browsing web pages, transitioning between tabs (windows) and opening up new web pages working fine. There's an accelerometer in there to detect between vertical and horizontal orientations. The body is solid, sturdy and graced with a bright 12-inch screen. The back is curved and made of a plastic that feels nice in your hand, and the whole thing doesn't seem too heavy to prop up on a bed or a toilet. 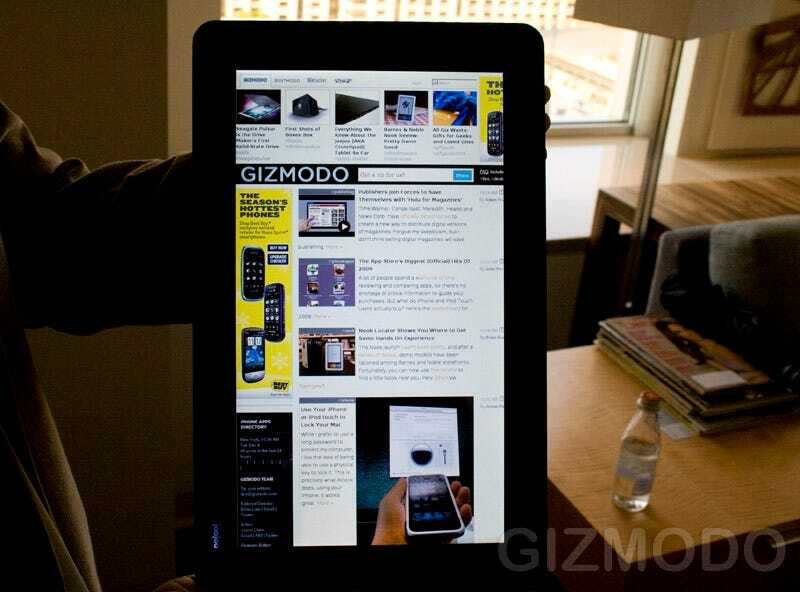 In short, it's an actual web browsing tablet that you'd be perfectly fine using. The entire system is basically a gateway to your browser, which is based off WebKit, the same code that powers Safari and Google's Chrome. It's fast, and handles gestures (pinching to go back a level, swiping to move up and down) just fine. There are other gestures that will be included in the final build, like two finger swiping for going back and forth in history and a bookmark swipe, but we didn't get to see that. But, you can't zoom into text. That's partially because the pinching is already used for going in and out of your windows into the home screen, but also partially because the screen is 12 inches. You don't need to really zoom into text on a laptop-sized screen of 12 inches. And they also said they may make LARGER sized tablets as well, with 12 being their smallest size. JooJoo's keyboard looks like this, and takes up only a portion of the screen. It's usable, but you don't want to use it to bang out a blog post; this is mainly for consuming media. Fusion Garage's concept for the product is that the "internet is the application", which means you can't save photos or files locally and you can't access any of the 4GB of storage to do any user level stuff. The most you can dictate is how much each internet application (e.g. Gmail or Google Wave) can have for a local cache. It does support Flash as usual, except when you play HD Flash it'll force you into fullscreen mode to render better/faster. And if you want to read PDFs, it'll force you into Google's web-based PDF doc reader. So it handles PDFs, but not "natively". Your home screen is composed almost entirely of icons—shortcuts—to web applications. The screen is customizable with your own applications, eventually, and has a weird feature where it displays a different color background whenever you go back to it. Fusion Garage is thinking of taking this out, or swapping it with some other feature. As for multitasking, Fusion Garage says that they will have specific APIs available to webapps to incorporate in order to pass notifications up to the user. For example, if Twitter refreshes in another window and you're watching a YouTube video, a popup will show and tell you you have something else going on. The APIs will be available at launch, but it's up to websites to support them. Despite its weird birth issues this past week with all the Arrington trouble, the JooJoo is surprisingly solid. You can tell Fusion Garage spent a good deal of time polishing the hardware, by the fact that they managed to include a 12-inch screen that's decent enough to not have lousy viewing angles, plus support 1080p HD video playback. The only trouble right now is software, which is only about 75% done. Fusion Garage plans to ship devices about 8-10 weeks after preorders, which start this friday. If FG can manage to finish the software and get it to a point where it's transparent to the user who just wants to get online, $500 isn't too outrageous a price to pay. Decent netbooks are around that price, and it's about the price you'd expect Apple to charge for their tablet, if not even more. We'd of course be very happy if it were down at $300 or $400, but it's basically a new device in a new market, and you'll have to hand over a little extra for being an early adopter.